The designer kurtis are the heart of Indian ethnic wear. They are the most popular choice of attire for the college girls, young professionals and the housewives. The kurtis are the most hassle-free dress available in a wide spectrum of vivid colours. Their exquisite patterns and drooling cuttings make them a favourite among the fashionistas. There are a large number of patterns of kurtis available in the market right now. The tail cut kurtis, trail cut kurtis, princess cut kurtis, A-line kurtis, straight cut kurtis, slit kurtis, etc. Among all these types the trail-cut kurti and the princess-cut kurti has been in the trend this season. They are considered the latest style statement and offer you a charming look. If you wish to buy some exclusive designer kurtis online then you can log in to the websites of Fynd, Craftsvilla, Myntra, Jabong, Mirraw, etc. Let us now take a look at the differences in the trail-cut kurti and the princess-cut kurti. The trail-cut kurti have two C-shaped cuts on its both sides. It gives you an asymmetrical look. The trail-cut kurti is a new innovation in the patterns of kurtis. It has become very popular among the college girls nowadays who love to try out something new when it comes to outfits. There are a lot of variations and flexibility in the form of prints, fabric and designs in the trail cut kurtis. The princess cut kurtis is a popular form of kurti since it has been introduced in the fashion industry. It is still considered as one of the most magnificent choices of attire which has mesmerised the fashion fiestas. The princess cut kurtis has a symmetrical, straight cut and they flare up from the waist level. They are very comfortable and can be used as a college wear, office wear or during friendly outings. The trail-cut kurti are considered Indo Western in their attitude. The asymmetrical shape of the kurti is an instant hit among the college girls. They can be smartly paired with jeans, jeggings or palazzo pants. The trail cut kurti are so stylish in itself that it requires very less embellishment in the form of accessories. A sling bag and smart drop earrings look perfect with this look. The princess cut kurtis is more ethnic in their looks. They can be teamed up with leggings or churidars. It is a perfect assemblage to be worn during Indian wedding functions or any social event like puja ceremony or any cultural activities. You can accessorise the look with a designer clutch, a chocker and chandelier earrings. The princess cut kurtis is considered one of the most refined and sophisticated attire in the apparel industry. The trail-cut kurtis are mostly made in chiffon, georgette or satin to reflect the asymmetrical look. Since this kurtis are Indo-Western in their approach they do not have much embroidery work. You can find them in solid shades or in the printed form. The princess cut kurtis is mostly made in cotton or silk. They offer a royal ethnic look to the person adorning them. This style of kurtis generally has embellishment in the form of embroidery work like chikan work, zari work, appliqué work or kantha stitch work on the neckline, sleeves and hemline. The princess cut kurtis is the favourite choice of outfit for the women in Indian social functions. So, these were the basic differences between the trail-cut kurtis and the princess-cut kurtis. 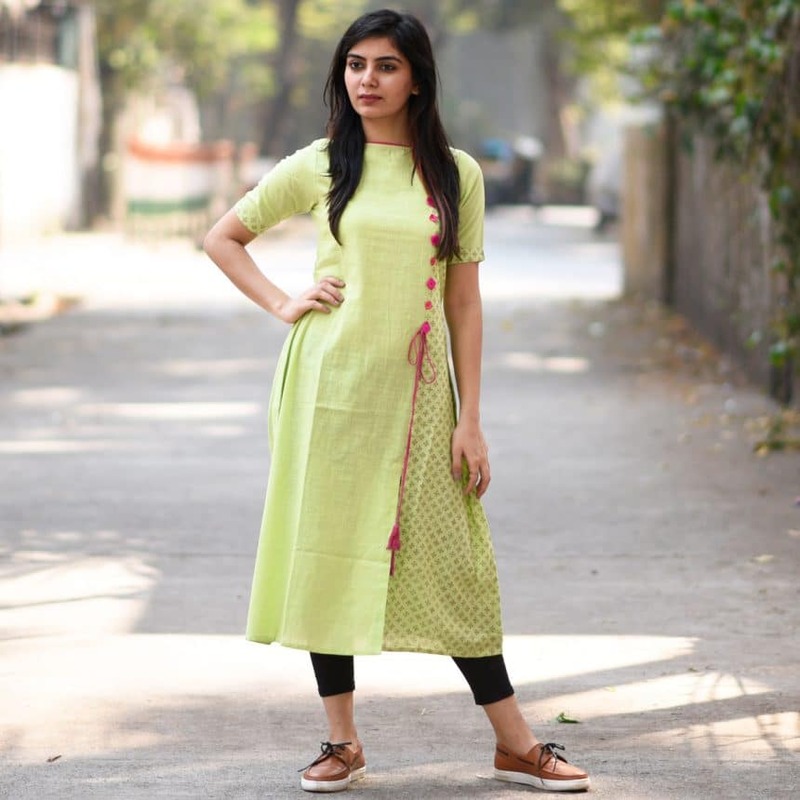 If you wish to check out some latest arrival of these types of kurtis then you can log in to the websites of Fynd, Craftsvilla, Myntra, Jabong, Mirraw, etc.